Ice skating is fun and generally considered safe for everyone with a reasonable level of fitness. It can, however, present some dangers when you consider that ice is always slippery, public rinks are often crowded, skate blades can be sharp, and there is always the risk of physical contact in the form of collisions. Here are some simple ice skating tips to make sure you go home as healthy and happy as when you arrived. When buying a pair of skates at a public venue, make sure they fit you properly. Don’t be afraid to ask to change any skates you are given if they feel uncomfortable, or if they are either too big or too small. It is vital that feet and ankles are adequately supported on the ice to give the correct support and prevent blisters or twisted ankles. If you are buying your own skates, it is a good idea to wear thick, heavy socks (the type you will be wearing when out skating) to make sure you buy skates of the right size. The blades of your ice skates are supposed to be sharp so they cut into the ice, helping you grip, skate, stay upright and stop safely. Skating on dull blades can be dangerous. As with everything, ice skating is much more fun when you know how to do it and can stay upright. It is possible to learn on your own, but if you can have a few lessons beforehand you will enjoy it much more. If you can’t take professional lessons, try to get some tips and help from friends who are already proficient skaters. Both children and adults should know how to fall correctly so they don’t hurt themselves. Falling correctly includes learning to fall backward rather than forwards as this reduces the chance of injury to your wrists or head. Always learn the basics before you try to do more complicated moves such as jumping, spinning, or skating backward. Skating on frozen ponds may seem like fun at the time but should only be undertaken with extreme caution. Even ice that looks thick and safe can crack, and falling into icy water is extremely dangerous and can even be fatal. Always make sure the ice on a frozen pond is at least 4 inches thick, and you should never go pond skating on your own. As well as having someone accompany you on to the ice, there should also be someone watching from the side who can quickly get help if needed. If you hear or see the ice cracking, distribute your weight evenly across the ice by dropping down and crawling. You will have more chance of getting to safety than if you try to skate away – regardless of how fast you can move on the ice. 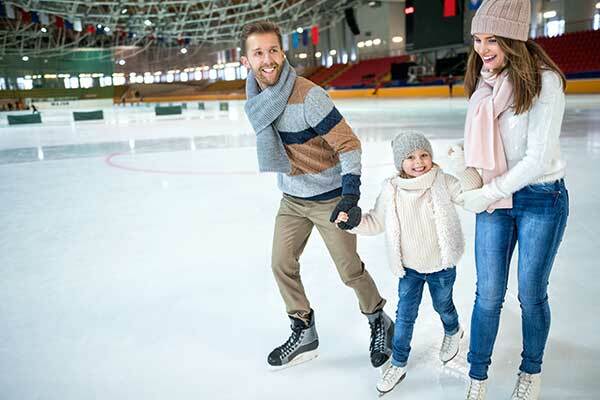 When visiting a commercial or public ice rink make sure you know the local etiquette, such as which direction people are skating (clockwise or counter clockwise), how long you can skate, what rules about contact are in place, and if any areas of the rink are reserved for speed skating or set aside for beginners. Most skating rinks will ban horseplay of any kind, including games such as crack the whip or tag. 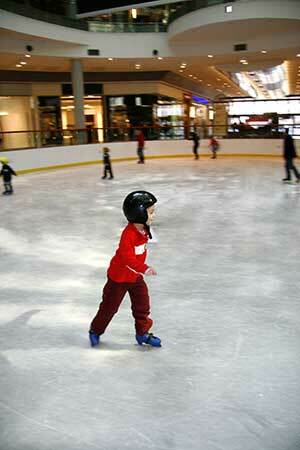 If you’re unsure about any of the rules of each individual rink, always ask before you take to the ice. If you are making or using your own ice rink, make sure it has clearly defined edges so skaters don’t accidentally run out of ice, and those who are not skating don’t step on slippery patches. It’s also important to maintain the ice in good condition by patching up any chips or holes as soon as they appear. If any ridges appear in the ice that makes it dangerous to skate over, cover up the area with a brightly colored material (or cordon off the area) so people know to avoid it. If you’re setting up floodlights for use after dark, make sure extension cables or trailing leads are well away from where people walk. Not only do they create a tripping hazard, it is also possible that skaters will slice through them with their skate blades. Most ice skating safety is common sense but it is worth being aware of some of the things that can go wrong so you can avoid them. It’s great fun and a fine way to get some exercise during the holiday season.